After an amazing 2010 summer of running, I felt I could tackle another marathon which would be my fourth in the year. Besides the excellent August Adelaide race, I also set a PR in the 5k (19:21) and the half-marathon (1:29:43). And to stay on schedule to finish the 7 continent goal in 2011, I really needed to complete continent 5 in 2010. Leaving 3 to the next would be too risky. So, I started to scan the calendar. Since I was already working with two developers in England, Africa seemed the logical destination as I could work that into a trip to Europe. Originally, I wanted to run in South Africa, but given a few recent events of people I knew getting mugged, that was off the table. 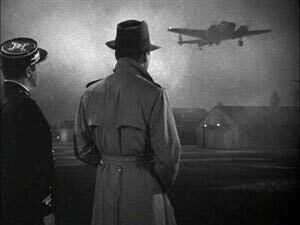 Then I stumbled on the Casablanca Marathon. Only in its third year, the location and short flight from the UK (3 hours) made it the perfect weekend excursion from London. 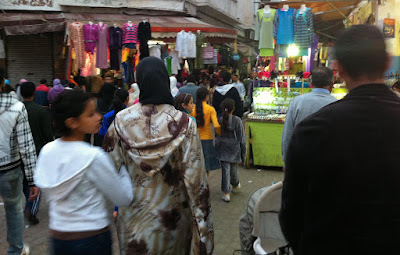 I always had wanted to say I've been to Morocco, and while Casablanca wasn't reputed to be the best of the cities there, everything else seemed right. Plus, Casablanca is Casablanca. Don't believe what you hear in the movies. Actually, the trip started well. On the plane, I sat next to a family from London. Mom, dad, grandma and two kids were scattered amongst me. I sat next to grandma. During our chat, her daughter, Jane (the mom in the family) popped her head over the seat in front of us. Having heard my reason to go to Casablanca, she announced that she was the Executive Director of a charity that is tied to the London Marathon. If I wanted to run that, I should let her know. (And in fact, I am running for Rays of Sunshine this April just a few months prior to the London Olympics; Rays of Sunshine is similar to Make-a-Wish, and Jane made no hesitation of keeping her offer.) Thus, things began wonderfully. I arrived late at night, so it was only the next day that I decided I didn't like the city. Dirty (by any standard) and run down. But even that wasn't what really bothered me. 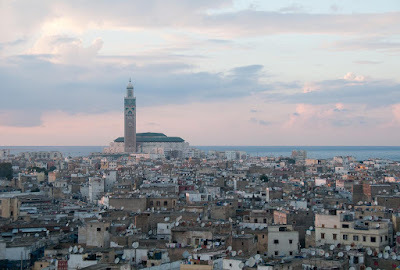 Here existed a famous city - not only from the eponymous movie, but also from World War II (Patton was based there; Roosevelt, Stalin and Churchill summited there) and history - Casablanca is a deep harbor and has been a port for hundreds of years. 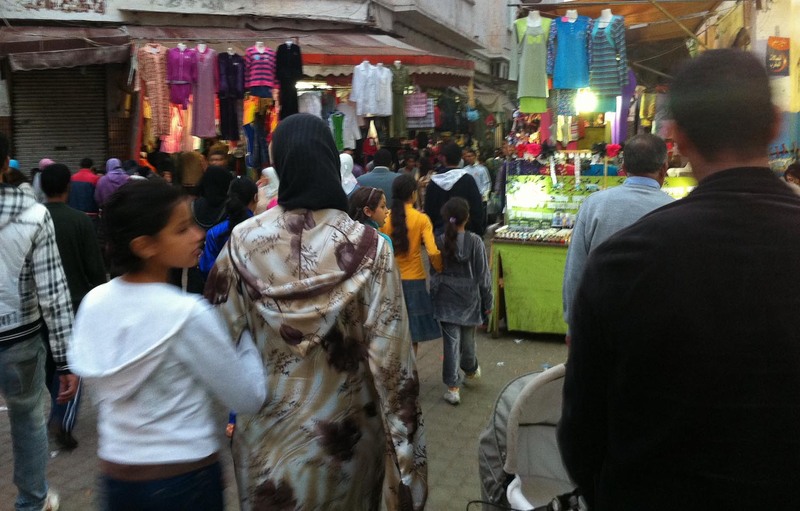 But after being a colonial French city, it suffers from being of two cultures. Of course, the Medina is what you would expect. Twisted small streets filled with shopkeepers and smells and kids running amok. That part I loved. In fact, I felt safer there than on the huge wide boulevards clearly of French design. As in defiance of the French occupation years ago, those elements are the ones that need the most care. Ironically, without those huge streets lined by massive walls protecting wealthy homes, there could be no marathon in the city. The smaller streets would not provide enough width. I looked up the course for the Marrakech Marathon, and most of its course runs outside that city. (That marathon takes place annually in January.) I endeavor to relaxt the day before a marathon, but being in a place you do not like just makes that day seem endless. The best part of the marathon check in was meeting fellow running Martin from Toronto and New York. We quickly discovered we were going to Antarctica together the following February, so we had lots to talk about. If you think 7 continents in 4 years is nutty, Martin just finished all 7 in 3 years and also completed the 5 majors (London, NY, Chicago, Berlin and Boston) during the same time and before his recent 40th birthday. And he ran 3 of those in under 3 hours. But back to check in. The marathon had an advanced discounted price; but there was no way to pay online. So of course, I paid the full amount. The cost was inexpensive, but the principle of it stank. Even getting your bib was odd - you had to pay at a tourist kiosk unrelated to the marathon and a few blocks away. It was all very strange. I'm just glad they actually had my name on the list as some others I spoke to had a tough time registering from scratch. The Mosque can be seen all over town. I was 5 miles away at my hotel. I will say that one thing about Casablanca that is impressive is the Mosque. Located near the ocean, this huge (and when we ran past it, I saw how huge) building dominates the sprawling city. Beautiful and detailed, the building apparently claims the records as the largest Mosque in Africa. I do wonder if my impressions of Casablanca - almost exactly a year old as I write this -are tainted by not running a very good race. I admit that possibility is real, although as I look back at my notes, I was critical of the city before I even ran. So what went wrong with the race? First, I went out too hard. I ran the first half without stopping at all. That gave me a good 13 mile split time, but I got behind on hydrating and then it got quite warm. I vaguely recall the next bit of the marathon. In fact, I was out of it enough to have stopped my GPS watch for about 2 miles. (I thought I was hitting the lap button.) After being surprised I had so much more to run, I realized the thing was not moving and restarted it. But then I only sort of knew how far along I was in the race. The kilometer markers either were missing in spots, or I was too oblivious to see them all. After leaving the Mosque, the rest of the course ran pretty much through the business district. Fortunately, spectators were out in large quantities, because the scenery was bland. My final time of 3:44 was slow compared to my recent races (and in fact compared to the 2011 LA Marathon a few months later). I basically call myself a 3:40 marathoner - my average for the standard marathon. 6 of my finishes fall below that time and 6 above. So, I'm a bit snobbish for being bummed about a time like that. Yet, I had set my expectations higher, and that lead to disappointment. 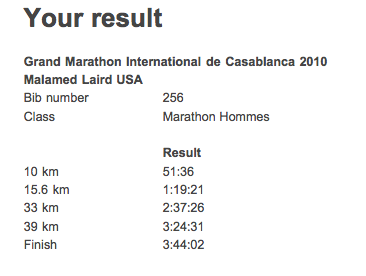 I also suspect my disappointment in this marathon relates to the notion that completing Africa in Morocco feels like cheating. When you say "Africa," people conjure images of tigers and lions and zebras. It's almost like Casablanca is accidentally in Africa. In fact, while's it's south of London, it's also west of London too. So much for British East Africa and the nile and Mt. Kilimanjaro. Hemingway would not take kindly to my version of Africa. He would demand I visit the Africa he wrote about. But Casablanca is indeed in Africa. And I did complete the marathon there and satisfy continent number 5. And for that I'm grateful. I had no issues in the city, and when I reached to the beach part of the marathon, I liked it a lot more. Everyone was very nice; plus I made new friends. - Peter Lorre just before he is killed. Fortunately my exit was a lot less dramatic. I learned to be less concerned about performance from this race. I sort of intellectually knew that prior to this run, but I began to feel how important it is to just enjoy the act of running. At any speed and in any place. Just a few weeks ago, I found I had to put this to the test. I completed my last 20 mile practice run in some pain - a pain in my ankle I had never felt. I took a week off from running to let it calm down, and fortunately, I think it's fine. But I really don't know how it will do over a marathon this Sunday. Yet, I know I am trained well enough to finish no matter what happens. Having learned that this is what matters, I made sure that I did not let this set back get in my way of preparing for this trip to Brazil and Chile - or enjoying any of it so far. Sometimes you need to hit some lows before you can find your equilibrium. 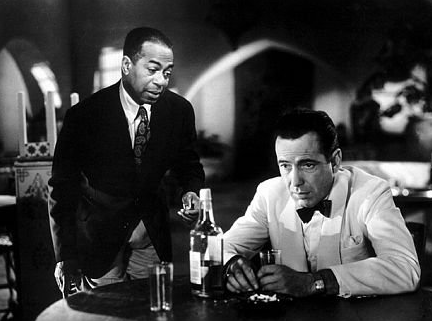 Certainly, Casablanca was the low point of my 7 continent quest. Some day, and maybe not too long from now, I'll run another marathon in Africa - one worthy of the imagery that continent evokes. Fortunately, I didn't have to wait too long to go on the true journey of a lifetime. From the dark continent of Africa to the great white one: Next, we head south to Antarctica. Postscript: While I did watch Casablanca before I left for the race, I never did visit the touristy "Rick's American Cafe" that operates in the city. I felt that was certainly going to ensure I was disappointed!